This week, Tordrillo Mountain Lodge has been featured by The Points Guy in their article on the Best Northern Lights Adventures for Families. Not everyone considers Alaska when planning a trip to see the Northern Lights, but viewing the Aurora Borealis from a remote luxury wilderness lodge while soaking in your own private soaking tub is an experience that will stick with you for a lifetime. The Points Guy is an American travel website that produces news and stories on travel, aviation, points and miles, and credit cards to help readers maximize their travel with hands-on travel advice, guides, reviews, deal alerts, and more. Checkout the feature by The Points Guy here. Deep in the Alaskan mountains is a lodge owned by a former Olympian downhill gold medallist, with a virtually exclusive claim on 1.2 million acres of snowbound slopes. It’s the gold standard of heli-skiing. Andy Isaacson drops in. I charged after my guide into an untracked bowl that resembled all the other treeless slopes stretching out to the horizon. After a few turns, this giddiness morphed into a creeping sense of disappointment, my mood changing like a record that suddenly skips. “I’m not liking this,” my guide said. It wasn’t supposed to be like this. In the powder hound’s imagination, Alaska skiing occupies an almost mythic space – the realm of ski movies: stunning panoramic landscapes, steep couloirs etched into jagged peaks, 1,500m descents. Alaska’s maritime coastal ranges receive over 15.24m of average annual snowfall – heavier stuff than elsewhere – that sticks improbably to rugged rock spines. In March and April, ski days can stretch well into the dinner hour. Everything here feels larger, more expansive; Alaskans often refer to contiguous America, below Canada, as simply “The States”, as though they occupy a different country. Up here is a wilder, boundless canvas for adventure. It’s the first day of spring, deep in the Alaskan bush, and I’ve walked into a celebration. Sitting at a long dinner table inside a log cabin, 24 people clink wine glasses full of pinot noir and feast on wild-caught king salmon, kale, potatoes, and couscous, all of it swimming in a tomato-saffron sauce. The lights are dimmed inside the lodge and the glow from the star-shaped chandeliers reflect in the wine glasses, creating a sparkly galaxy along the length of the table. A Marvin Gaye tune plays over the speakers. The revelers here, including an Internet tycoon and the owner of the largest horseradish producer in the United States, are on a seven-day vacation at Tordrillo Mountain Lodge (TML), the country’s swankiest and most remote heli-ski operation. TML, which is located about 60 miles northwest of Anchorage and is only accessible via a single- engine ski plane that lands on a frozen lake (just steps from the lodge we’re sitting in), is a campus of opulence, complete with spa-like amenities and five-star dining. The nearby Tordrillo Mountains are also flush with some of the world’s best skiing: a mecca of everything from mellow bowls to couloirs and classic Alaskan spines. But this crews’ first few days have been rough. Heli-Skiing Definition: Heli-Skiing is off-trail, downhill skiing that is accessed by a helicopter. It's about skiing in natural environments without the effort that comes with hiking to these areas. Most heli-skiers are looking for powder snow, natural terrain features, long descents, smooth corn snow, old-growth tree glades and steep lines. Heli-Ski guides and operations offer skiers the opportunity to ski with minimal risk in the backcountry. You don't need to be an extreme mountaineer to find yourself on top of a huge mountain in the middle of the wilderness anymore. Heli-Skiing is NOT jumping out of a helicopter! The helicopter acts as your lift to the top of the mountain where the helicopter lands and skiers exit and put on their skis to start their descent. Years back, taking a helicopter to remote places for the chance to ski untracked powder runs was seen as something for only the most daring. Today Heli-Skiing has become a socially acceptable form of family fun. Ski movies often show heli skiers navigating only the most extreme terrain. Although those lines are accessible via chopper, the majority of heli-skiers are intermediate skiers looking to experience the backcountry in a safe environment. Whether it's the idea of riding in a helicopter through some of the most beautiful heli skiing terrain in the world, or skiing incredibly long runs of totally untracked powder, Heli-skiing is the perfect way to do it. Beside the fact that you can do all of this at your leisure without having to race people to get one line of fresh tracks for the day. This makes Alaska heli skiing the perfect option for your next family vacation. Though you are very likely to see Moose and Bears while in Alaska, the Moose and Bears will not be found trying to steal your first tracks or eat you for a pre-dinner snack. Your guides are always looking out for wildlife from the heli and will often point them out to you as you fly over them. They are mostly found in the lower elevations and viewing them from the heli is really the best vantage point. When you get to the lodge make sure to ask Lodge Manager Bret Gilleland about her "close encounters of the bear kind". Myth Number 3: Heli-Skiing in Alaska is super rustic and it's hard to find nice accommodations. Myth Number 4: Isn't Heli Skiing in Alaska just for crazy "huckers" trying to ski spines and outrun avalanches? Yes, Alaska is the last frontier, and you do have opportunities to eat local, but you will not have to shoot your own Dall Sheep for dinner, cause your guides have done that for you over the summer months. 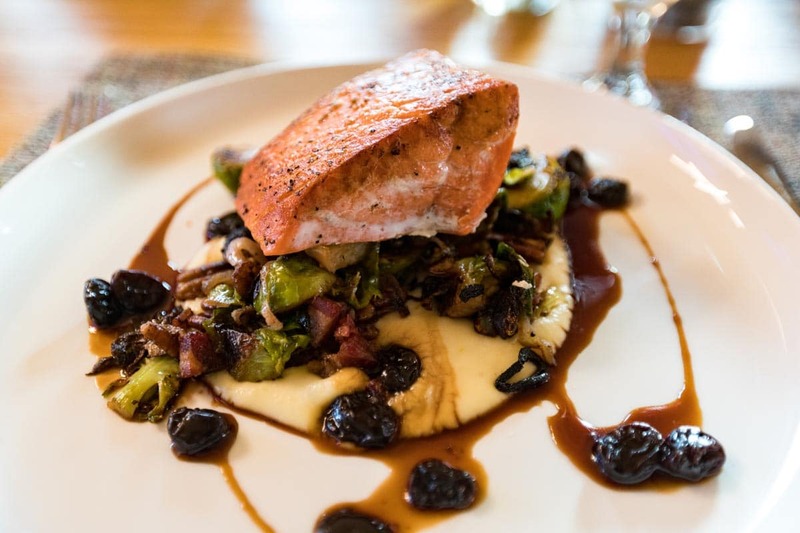 Since you work up quite an appetite heli-skiing in Alaska, Tordrillo Mountain Lodge's Executive Chef Brendan Nolan has a week of dining ecstasy planned for you. Make sure to tell him your favorite dishes and don't be surprised when you walk down to breakfast and are handed your favorite omelet cooked exactly how you like it. Why Alaska? Because it's the best snow on earth! Many States and resorts in the United States try to make the claim of having the best snow on earth, but you'd be hard pressed to find better snow quality anywhere on the planet than Alaska. Many people think powder skiing is challenging because their only experience in powder is at their local ski resort when it is cut up with lots of tracks. This gives a very irregular surface and makes it more challenging to ski. No one can guarantee snow conditions, and mother nature is always mixing things up. Perfect snow can get wind affected and go from lightweight fluff into wind scoured Sastrugi. For those of you not familiar with that term, it is a condition that puts grooves and ridges into the snow and makes skiing a bit more challenging. What many people don't realize about powder is that it is much easier to ski when it is fresh and un-tracked. This is really the whole point of heli skiing, to ski virgin un-tracked snow and make your own fresh tracks. There is another key snow term that is illustrated in the attached photos and it's "Blower". This is when the snow is so light and fluffy it billows up and blows up around you. Stay warm and cozy. When heli-skiing, you finish your run and the Helicopter picks you up and whisks you away to your next perfect run...you stay warm and dry. Have you ever wondered how good do you have to be to go heli-skiing in Alaska? You will be surprised by the answer. If you can ski blue terrain comfortably, you are good enough to go heli-skiing. Now in the old days, this was not true, but due to the invention of fat skis, most all solid intermediates can go heli-skiing. In the ski movies, Alaskan Heli Skiing is often portrayed via "sick descents" with snow sluffs all around, but in reality, there is a huge variety of amazing blue heli-skiing terrain available. I'm sure you are wondering why fat skis make such a big difference? First of all, the fatter the ski, the more likely you are to stay on top of the snow, if you are skiing on a ski with a narrow sidecut or waist, the ski will sink into the snow and make it harder to start and finish a turn. You can even skid in powder on fat skis! Fat skis also allow skiers to go much faster and still feel confident and in control. Often you ski on a longer ski in the powder as well, so you have both length and width working for you. Something to remember, heli-skiing is ALWAYS better than resort powder experiences where you are skiing across multiple tracks. AND, you don't have to fight for a line heli-skiing. Heli-Skiing is very orderly and calm. The guide usually skis first and you are instructed where to lay your tracks in relation to the guide's tracks. Be it superb river to table dining, fresh seafood, or garden vegetables - you can’t beat the sophisticated lodge dining of Tordrillo Mountain Lodge. The frisky Grayling was one of more than a dozen catches of the morning, effortlessly pulled from the shimmering rivers that snake through spectacular big-mountain terrain at Tordrillo Mountain Lodge. Straight from the door of the rustic-chic lakeside camp, from July through September it’s all about five-star Alaska heli-fishing, heli-hiking, a full menu of multi-sport adventure -- and some top-drawer hospitality and dining. After a scenic 40 minute float-plane flight from Anchorage - Denali, North America’s tallest peak in the distance - we set down gently on Judd Lake. The long clear lake makes a serene backdrop for the luxurious Alaskan lodge - outfitted with all the best outdoor adventure toys. All the top-quality gear for fishing is provided but that’s only the beginning: there are rooms full of rafts, skis and bikes, SUP, canoe and kayak paddling, Jet Skis, wake and foil boarding, ice climbing and rock climbing. All activities are accessible from the door and from your own private helicopter. Mountain Meetings Magazine: Most of us have only watched the Winter Games from afar, so getting a taste of where the world’s best athletes compete and train is a truly special experience for groups. In tandem with the recent XXIII Olympic Winter Games in PyeongChang, Korea, Mountain Meetings looks at the legacy the Olympic Winter Games have left in Vancouver, Salt Lake City, Calgary and Squaw Valley for meetings and events. Tordrillo Mountain Lodge included in Gearhungry List of 10 luxury resorts outdoor enthusiast will love. An all-inclusive retreat designed for outdoor adventurers, Tordrillo Mountain Lodge fuses lavish accommodation with extreme sports that will excite any adrenalin junkie. In the summer, there’s salmon fishing, hiking and river trips to make the most of, while the winter offers up a whole new roster including snow hiking, fat biking, heli-skiing and a host of other cold-weather sports. When you’re not out in exploring Alaska’s incredible scenery, there’s fine dining to enjoy back at the resort as well as an on-site spa, saunas and hot tubs – the perfect way to warm up after being immersed in Alaska’s chilly climate. This amazing resort is fantastic year-round and is the perfect balance of luxurious touches and rustic elements. It's not just that they are about to swoop over south-central Alaska, which is prime moose and grizzly territory. They're also about to check Alaskan heli-biking off the bucket list. Yes, it's exactly what it sounds like: A chopper with bike racks attached to the sides flies you over wide open spaces and drops you and a guide off in a remote location. Within minutes, the Royers land on the side of Mount Susitna at about 3,500 feet above sea level. Their guide removes several fat-tire bikes from the chopper's racks and the group of four gears up with helmets, pads and gloves. They start to pedal but find it's hard to focus on important things such as dodging rocks and executing turns. Why? The scenery is so darn distracting. The Tordrillo Mountain range dominating the backdrop includes an 11,000-foot volcano. There's open alpine tundra as far as the eye can see, wildflowers in full bloom and, of course, glaciers galore. "Heli-mountain-biking with fat bikes opens up what was once completely inaccessible," says Overcast. "By eliminating brushy approaches and going straight for the alpine tundra and cinder ash, we can get guests straight to the prize. The views alone make the trip." Today the intrepid group is exploring miles of brushless terrain that has never been biked before, pedaling down smooth sections of firm tundra and alpine heather. It's an area reachable only by helicopter, and there are no signs of other humans on their journey. "My thoughts were: If we had an issue, we would be hard to find," says Joe Royer. Those concerns are quickly squashed. Mike Overcast, their guide and part-owner of Tordrillo Mountain Lodge, reassures them that he's invested heavily in communications. Tordrillo has radio repeaters that keep guides in touch with helicopters in the field and a microwave link that provides a dedicated data source faster than people enjoy in Anchorage. In the summer of 2017, Tordrillo started offering the unusual excursion in Alaska. Fast forward to today, and it's still one of only a handful of companies around the world that offers heli-biking tours to the public. The heli-biking season runs from July through September. Once the snow starts piling up, usually by October, they switch to fat-tire snow biking. Although heli-biking may sound like a daring excursion, it doesn't have to be. Riders who want a challenge can be dropped at 11,000 feet for a day-long adventure of dicey downhill routes. If you'd rather bike for a few hours on easier pathways, though, you can. Overcast says if you can ride a bike, you can do it. "Riders can choose a descent or ascent of virtually any length or difficulty, making this experience perfect for anyone interested in mountain biking regardless of their level of skill or expertise," he says. "There is so much out there," he says. "It will take decades to figure out." That's because the amount of terrain still to be discovered and biked seems inexhaustible. The hotel has access to 70 miles by 40 miles of potential biking space. "There are not enough days in the year to cover all this new ground," he adds. "Every time we go out, we are pointing out potential rides that we should check out." "We are on the dawn of a whole new wave of bikers, both with the remote heli-bike operations and the advent of full suspension electric bikes," Overcast says. "They are making what was once really difficult into a more mainstream sport." Many agree with him, including professional mountain biker Micayla Gatto. "Heli-biking could definitely gain enough popularity to become as common as heli-skiing," Gatto says. She does, however, worry about the environmental impact of putting a bunch of humans into otherwise untouched areas just to go for a bike ride. "I think if it is properly monitored, we respect the animals, and the terrain is kept as the number one priority, I think it could get quite popular as a luxury sport," she adds. Heli-biking is offered July through September. Other summer excursions include ice climbing, wake surfing and heli-fishing. In the winter, there's heli-skiing, hiking and sky trekking. 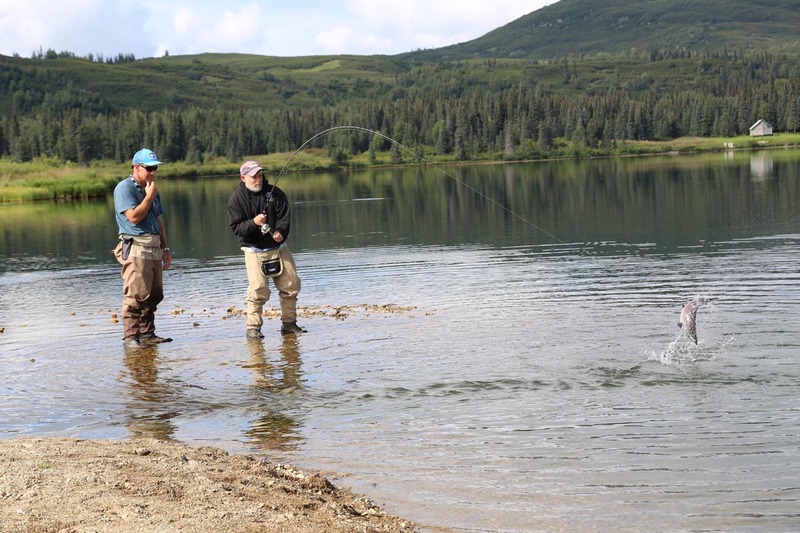 One of the most amazing experiences you can have at Tordrillo Mountain Lodge is fishing Alaska Wilderness landscape with the guides at Tordrillo Mountain Lodge. They are the best buddy you can ever have and they are knowledgeable about the rivers and the fish. Sometimes you are focused on casting for King Salmon, other times you pull out the fly rod and land some beautiful Rainbow Trout. The setting is serene and fishing is a meditation in nature. As top pro skier Amie Engerbretson says, "it's heaven on earth".